Don’t make him angry. Be nice and compliment him on his splendid use of mint and blueberry to create such a Hulk-like green and purple concoction. That way you’ll stay friends and he won’t rip you to shreds. Tell him that you much prefer cones to Kryptonite and that the evil General Zod deserves to be sprayed with raspberry ripple and booted into hyperspace. Then point out that Superman’s winning combination of cherry, vanilla and blue raspberry happens to be the favourite of Lois Lane. 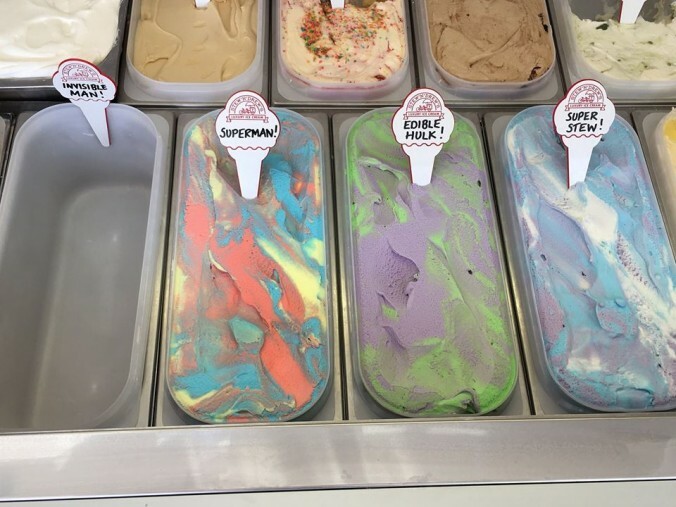 Just inform him that you seriously dig his inventive ice cream and confirm that his sublime mix of vanilla, raspberry and blueberry is the best thing since that time Lex Luthor slipped on a banana nougat wafer and toppled head first into Hopeman harbour. Accept that he is made of something far stronger than girders and on no condition challenge him to an arm wrestling contest because you’ll only come off worse and find that you are unable to hold a cone again. Buy him in bulk – whether it be a twin-top cone, a quadruple cone or a ten litre tub – for he contains zero calories and doesn’t cost a penny. The only downside is that you’ll never know when you have Invisible Man ice cream all over your face. But then no one else will notice either.